What better way to end 2014 than to celebrate friendship? 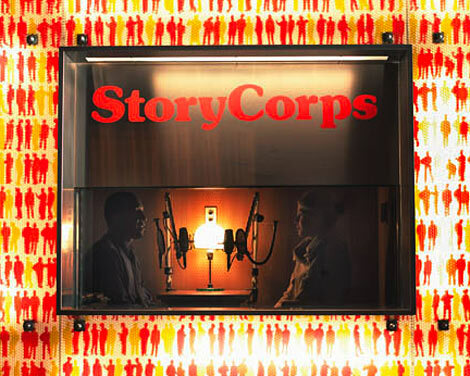 Thanks to the Disability Visibility Project, this past summer and fall scores of people from the SF Bay Area headed to the cozy StoryCorps booth at the San Francisco Public Library to record conversations with friends and loved ones. Assistant Director Emily Beitiks interviewed her longtime family friend Stanley Yarnell, who discussed being a physician as he relied less and less on vision, while I interviewed writer and Berkeley English professor Georgina Kleege about our great friendship built in part upon the idea that we call ourselves "imperfectly blind" because we see more than sighted people think we should. Listen to the interviews or download the transcripts compiled by our dedicated interns. There’s something profound at the root of these interviews, something daring, even subversive. First, disabled people get to tell the stories rather than have the stories told about us. This makes us experts, especially Stanley who talks openly about what it was like to be a practicing physician with a vision impairment, pushing the boundaries of credulity for many. Yet he also challenges the rules and raises questions such as what is medical care? What do we learn from our doctors about vulnerability, strength, and ourselves, whoever we are? Stanley's experiences wearing two hats that too often feel mutually exclusive - that of the physician and disabled person - is part of what first drew Emily to Stanley (and why she pestered him repeatedly until he agreed to record his stories for the Disability Visibility Project). Second, the interviews let the cat out of the bag: disabled people have friends, even and especially disabled friends who bring great joy and mirth to everything. In a world that never portrays more than one blind person anywhere except for special schools, Georgina and I have spent many hours, cooking, walking, gossiping, sharing stories about the odd overheard comment, swapping tips about the latest accessible apps or latest book we're reading, coming up with new teaching strategies, always leaving with more questions than answers. Just like for Emily and Stanley, disability was what kindled and sustained that inexplicable spark of friendship – a striking contrast with those Hollywood depictions of disability that tear people apart or make the bonding seem creepy! Just maybe 2015 will be the year of the first mainstream disability buddy film, one played by actual disabled people who can laugh about that ridiculous thing that happened on the bus or have discovered something wonderful about their humanity by helping a struggling nondisabled person. Or even better still, they could just be random friends in a bigger story that wasn’t only about disability. noun referring to a deep connection that two or more people have with one another thanks to disability. Alt. meaning: an accessible, crip-friendly spacecraft. Let every dictionary list this blog post as the origin of a word that finally exists to show the world something truly wonderful about disability.